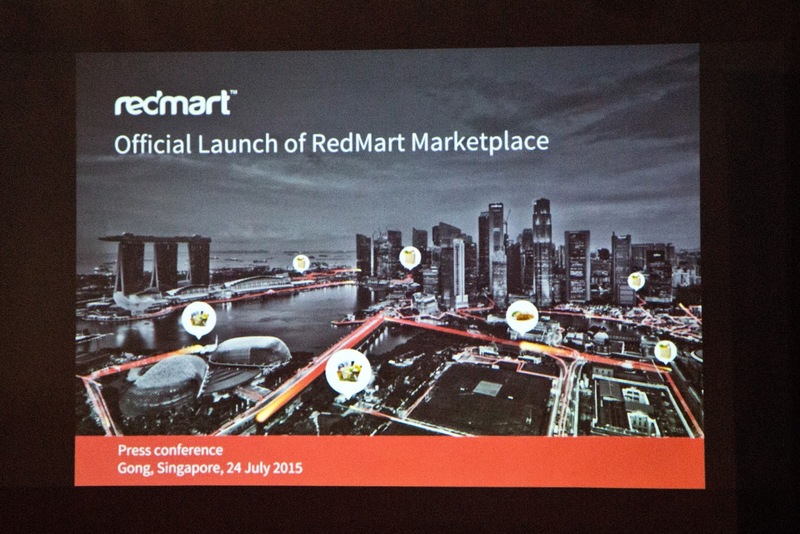 The official launch of Redmart Marketplace. I was curious about this e-commerce platform as apart from groceries and household items, wines are sold here as well. 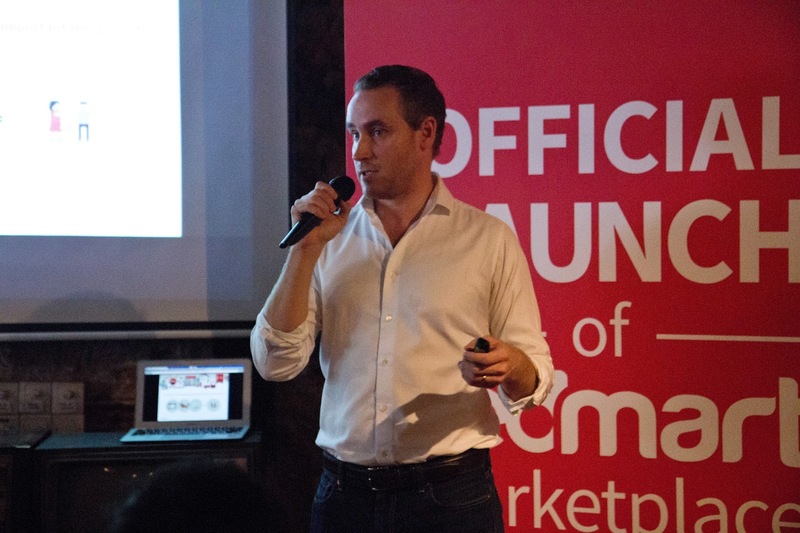 Roger Egan (co-founder and CEO) and his team explained that the ‘Marketplace’ concept allows independent merchants (retailers, wholesalers and distributors alike) to list and sell their products via the Marketplace e-commerce platform to RedMart’s customers. Individual merchants save on time and resources as they do not need to go through the rigours of setting up, running and maintaining their own e-commerce sites. 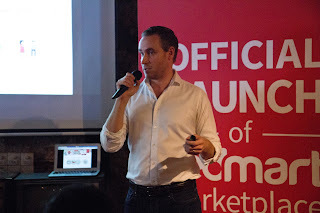 Merchants are also able to tap onto RedMart’s customer base for orders and the latter’s logistics support to get their goods delivered to customers. 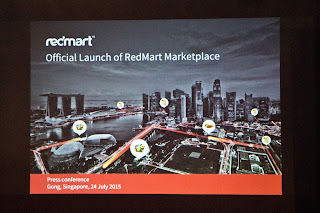 The RedMart customers get the convenience of placing their orders at one site (rather than needing to visit several e-commerce sites run by individual merchants) and importantly, the benefit of getting their orders consolidated and delivered to their doorstep. 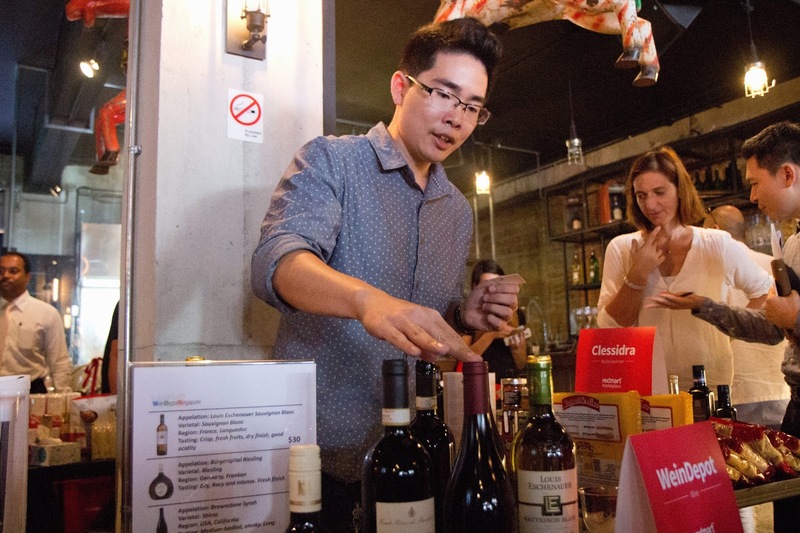 During this launch, I saw several established local wine merchants who are participating in RedMart Marketplace’s e-commerce platform; namely, The Straits Wine Company, Cellarmaster Wines, Angra Wine & Spirits, Weindepot Singapore and Carecci & Figli Trading. 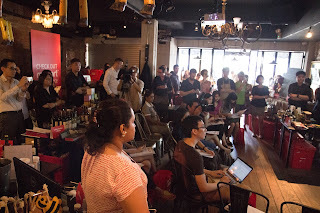 (The media kit also showed other participating wine merchants; namely Enoteca, VCT and Hai Choo Wines). Most of these wine merchants have been around in the local wine scene for some time. While a few have retail presence, most others sell to F&B outlets, clubs and direct customers. The RedMart’s Marketplace option provides an interesting avenue to reach local wine consumers I believe. The breakdown of RedMart’s current sales show 20% of present sales done are under ‘alcoholic products’ (wines naturally included within this category). It points to a consumer base which already uses the Marketplace e-commerce platform for purchase of alcoholic beverages. A promising sign for participating merchants. 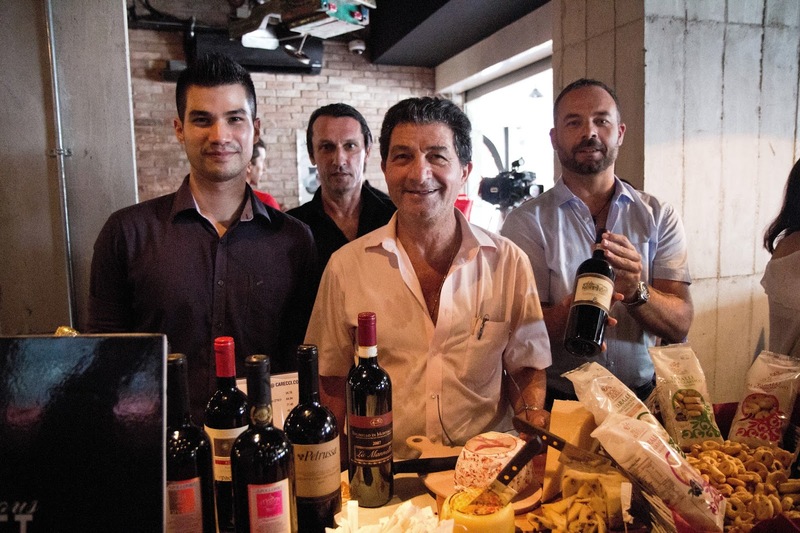 Serge Leveque, export manager of Ascheri wines, was in town recently to showcase several wines from this winery. This tasting was organized by The Italian Wine List (the local distributor of this label) for local wine professionals. 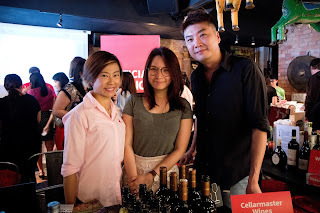 It was held at Praelum Wine Bistro. 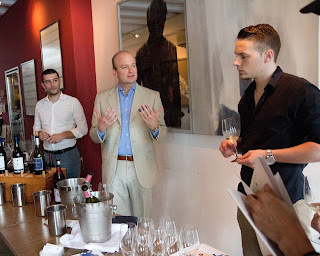 Serge Leveque explained that this winery first took roots in the La Morra region of Piedmont (at an area which went by the name 'Ascheri' as well) in the 19th century. In 1880, this winery and it’s cellars were shifted to Bra. (Back then Bra was an important distribution centre for Barolo wines and the owners of Ascheri Winery thought it made good sense to be closer to an important wine distribution centre.) 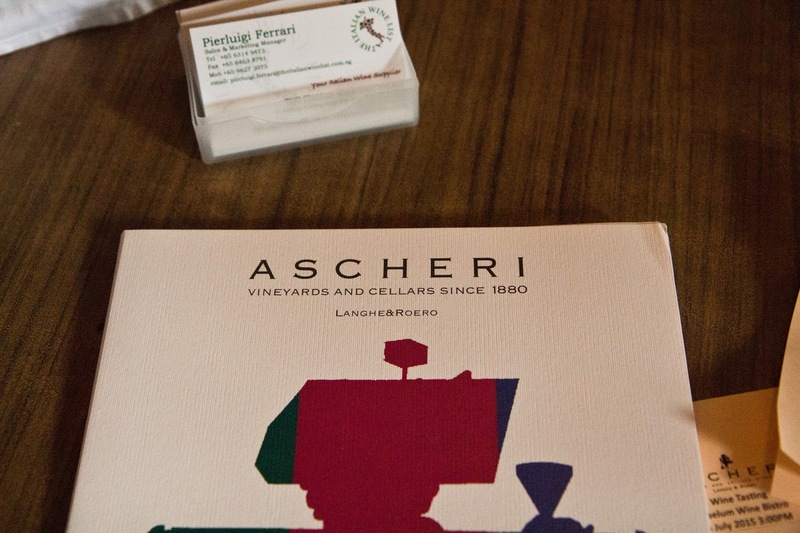 A hotel and restaurant was added to the winery at a later stage so that wine consumers can have a 'closer bond' and experience with Ascheri wines. At present there are 3 vineyards producing grapes for the winery. The first one at La Morra grows Nebbiolo, Barbera and Dolcetta varietals. The second one at Bra grows mostly Syrah and Viognier varietals. Finally the last one at Serralunga (at Alba) yields Nebbiolo and Dolcetta varietals. Annual production at present is around 150,000 bottles. 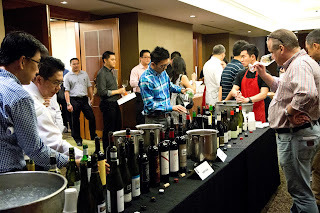 In Asia, Ascheri wines are exported to countries like Thailand, Malaysia, mainland China, Taiwan, Hong Kong, Japan and Singapore. During past wine meets with friends and at trade tastings, I've had the opportunity to taste both the Ascheri whites (Gavi and Arneis). Though of different vintages (than those shown during this trade tasting), these wines by and large display crisp, soft, approachable styles with subtle aromatic qualities (leaning more towards restrained elegance rather than being bold or upfront); pleasant wines for hot afternoons and evenings I must say. 2014 Cristina Ascheri Gavi di Gavi DOCG (100% Cortese varietal). Fermentation occurs for 10 days in stainless steel tanks. Aging occurs for 4 months in steel tanks, followed by minimum 2 months in bottle. Light yellow colour with green tints. A fresh, clean nose with pleasant, floral aromas. A light bodied wine; offering a refreshing body with crisp acidity present in palate. It's a wine which reveals a degree of lightness and delicate constitution. 2013 Cristina Ascheri Arneis delle Langhe DOC (100% Arneis varietal). The winemaking process is similar to that of the Gavi wine. A straw-yellow colour with green tints. Floral aroma; with palate showing minerality and stone fruit notes; reveals bitter notes in finish. Shows a good body weight and noticeable mouthfeel. 2011 Ascheri Barbera d’Alba le Fontanelle DOC (100% Barbera varietal). Fermentation takes place for about 10 days. Aging occurs for 6 months in Slavonian oak (75%new, 25% old); followed by minimum 4 months in bottle. Ruby red colour. Ripe berry aromas with violet hint. Body shows black berries, plum and spice flavours. An integrated sip which shows approachability in palate. 2010 Ascheri Barbaresco DOCG (100% Nebbiolo varietal). Fermentation takes around 12 days; followed by aging in steel tanks for 12 months and a further 18 months in Slavonian oak barrels (40% old oak and 60% new oak). Ruby red colour with garnet highlights. Aromas showing floral and spicy notes. Medium bodied wine in palate. Shows a soft, smooth textured wine with red berries, bitter and sour highlights (tannin and acidity at play); a rustic style of wine. 2010 Ascheri Barolo “Sorano” DOCG (100% Nebbiolo varietal). Fermentation takes around 15 days. Aging occurs 6 months in steel tanks, 28 months in Slavonian oak (85% old; 15% new) and minimum 10 months in bottle. A garnet colour. A scented bouquet with floral, spice and tar aromas. Palate shows a good balance between the components; berry fruit, leather and spice notes; a smooth texture with a supple mouthfeel. Acidity adds a vibrant dimension to the palate. Wine with aging potential. 2004 Barolo “Sorano Coste & Bricco” DOCG (100% Nebbiolo varietal). Fermentation takes around 15 days. Aging occurs 6 months in steel tanks, 28 months in Slavonian oak (60% old, 40 % new) and minimum 10 months in bottle. A garnet colour. Lovely aromas of spice, floral, leather and liquorice hints. An integrated wine with a smooth texture, manageable tannins and noticeable acidity; displays an elegant nature about it. Elements are harmonious with a rustic appeal. When you frequently attend wine fairs and see the offerings from particular wine regions, there is a tendency to form an idea on the types of wine which will be exhibited and grape varietals most likely to be used in similar wines in future wine events. The mind also tends to quickly detect anomalies from these perceived notions when reality throws something a little different. The Castilla-La Mancha event presented such a situation. Upon entering the event room, it was the wines at Bodegas Vidal del Saz's wine table which quickly caught my eyes. 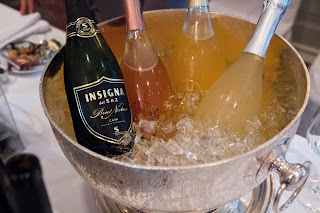 Some of the 'for bubbly shaped' bottles contained wines in amber-red, silver and deep lemon-yellow colours. Colours strikingly unusual to see in wines that the mind takes quick notice of the anomaly and moves you towards the table. A tasting showed they were sparkling wines with an off dry nature. The representative at the table explained that macabeo (viura) varietal is used for these wines. Fermentation is halted midway to retain some sweetness and exhibit low alcohol. (But the mind persists with curiosity; that's not the colour of a normal macabeo 'white' wine it contends; be it sparkling or still). The merchant explained that a colouring is added to these wines to give the eye catching, fun colours. The wines are Mavam Gold Fusion Fortune, Mavam Gold Fusion Vulcano and Mavam Gold Fusion Glaciar. These are meant to be a fun sips; party drinks made to be pleasant, light bodied, easy and approachable. Something certainly different. Creative wine labels capture one's eyes as well and make the wines stand out among tables of wine bottles. 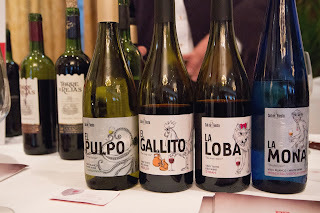 Bodegas Isidro Milagro showcased a range of such wines; 2 whites and 2 reds. A little creative effort certainly goes some way to capture one's attention. Among the white wines exhibited, I was looking forward to a good measure of Airen. (This is the La Mancha wine region after all). There was indeed; but equally there was a good representation from other white varietals like Verdejo, Chardonnay and Sauvignon blanc as well. For the reds, Tempranillo based wines were easily noticeable among the tables; either as a single varietal wine or showing in blends with varietals like Cabernet Sauvignon, Cabernet Franc and Petit Verdot. Cabernet Sauvignon, Merlot and Syrah also appeared as single varietal wines. What was pleasantly surprising was seeing winemakers exhibiting single varietal Petit Verdot wines; namely, Bodegas San Dionisio, Capilla del Fraile and Dominio de Punctum (not a common finding at wine events). Dominio de Punctum stood out during this event for their organic and biodynamic wines. Dehesa de Los Llanos (famous for its award winning artisan Manchego cheese) showcased some of its back vintages; giving trade professionals an idea of how well made wines mature given time. 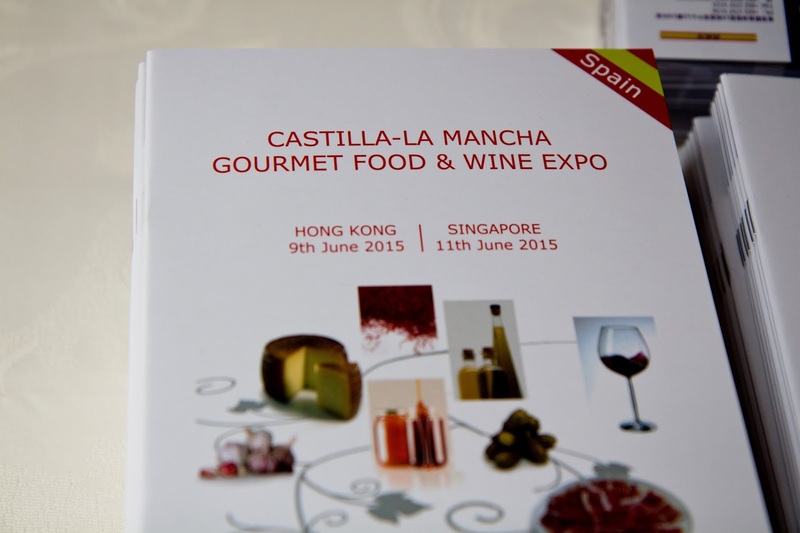 More pictures of event can be viewed at: Photo Album for Castilla-La Mancha event. 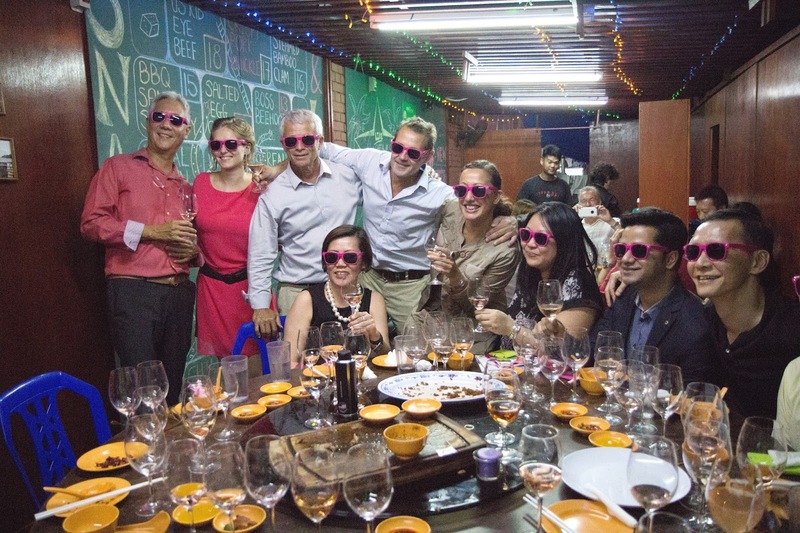 Wine Australia was in town recently to talk to local importers of Australian wines. 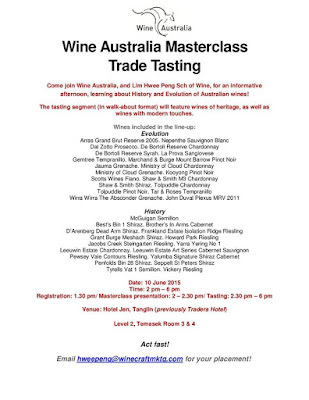 In conjunction with this event, it took the opportunity to organize a masterclass presentation on the history and evolution of Australian wines and a tasting session for local wine trade merchants and professionals. 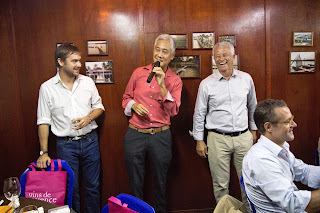 Mr Aaron Brasher (Regional Director for Asia Pacific, Wine Australia) and Mr Hiro Tajima (Regional Manager Asia, Wine Australia) were at hand during the masterclass and tasting session to share with local wine folks their views on Australian wines. 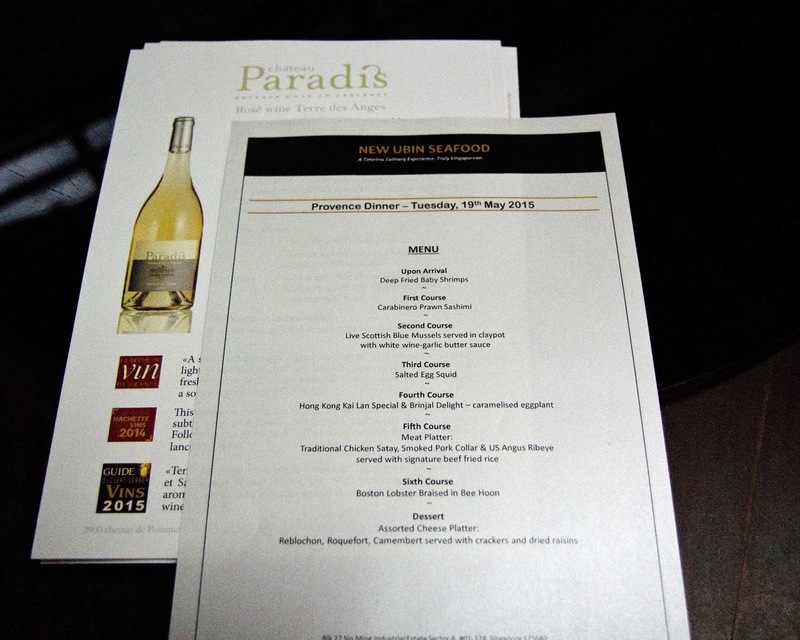 The tasting segment had wines under 2 categories; one the ‘History’ line up and the other the 'Evolution' line up. The History line up showcased several interesting wines which local wine enthusiasts will be familiar with in their wine journey; namely Tyrrell’s Vat 1 Semillon 2008, Leewin Estate Art Series Chardonnay 2012, Yarra Yering Dry red No 1 2008, d’Arenberg Dead Arm Shiraz 2010, Wynns Michael Shiraz 2009 and Grant Burge Meshach Shiraz 2008. 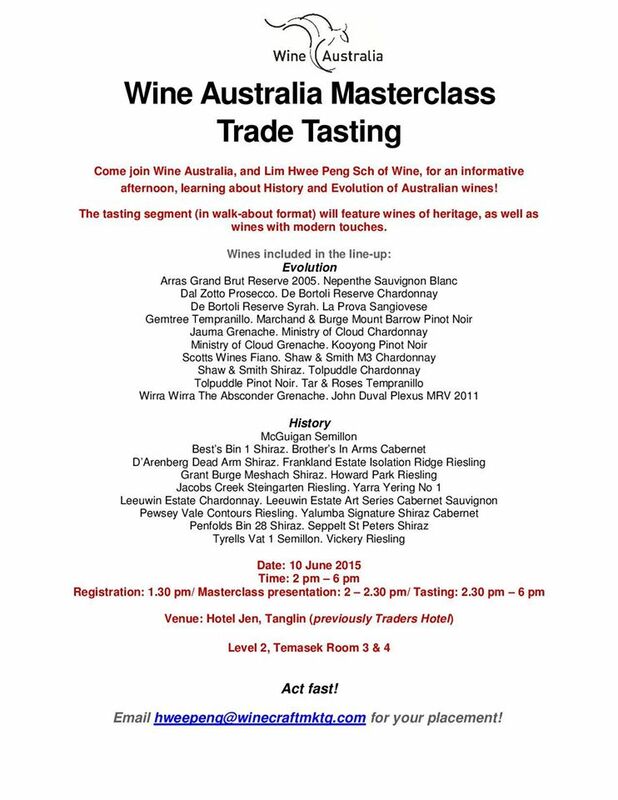 These are some of the 'notable' names one grows up with hearing and tasting as one explores Australian wines. When I was starting my wine journey and asking for wine recommendations, these labels were oft mentioned by wine enthusiasts back then as wines one should try when the opportunity arises. These are wines known for quality, consistency and 'familiar in consumers' mind. The Evolution line up was interesting for the new opportunites it offers. It conveys a sense of hope that not only cabernet sauvignon, merlot, shiraz, chardonnay and semillon varietals are recognized and recommended. There's room for other varietals and newer wine regions as well. Dal Zotto Prosecco NV, Scott Wines Fiano 2013 and La Prova Sangiovese 2013 highlights wines with Italian pedigree. Gemtree Luna Roja Tempranillo 2014 and Tar and Roses Tempranillo 2013 recognizes Spanish lineage. Arras Grand Brut Reserve 2005, Tolpuddle Chardonnay 2013, Tolpuddle Pinot Noir 2013, Ministry of Clouds Chardonnay 2013 and Ministry of Clouds Grenache 2013 acknowledge the growing importance and recognition of Tasmania as a cool climate wine producing region. 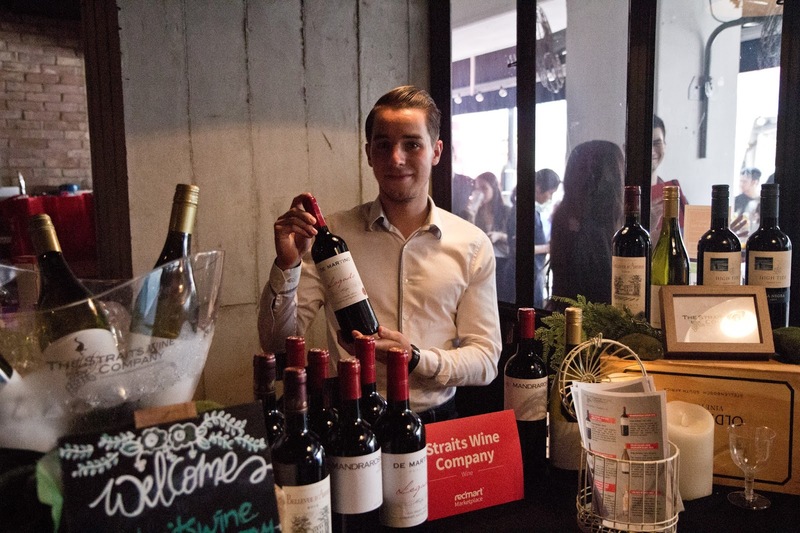 For local wine enthusiasts, there's hope for new experiences yet within the Australian wine scene. Organized by Sopexa, it was a wine dinner which showcased local cuisine paired with rose wines from Provence (at New Ubin Seafood Restaurant). 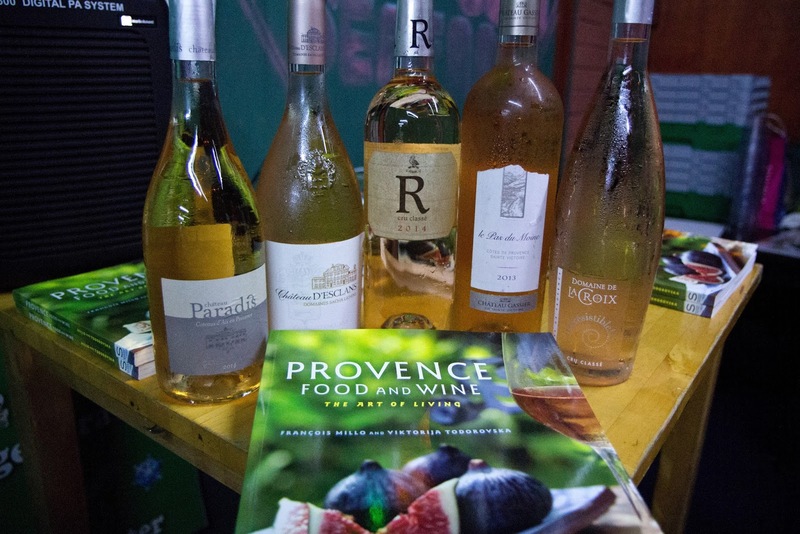 Mr Francois Milo, Director of Provence Wine Council and Edwin Soon (author of Wines of France) were at hand to share with us about rose wines and its versatility with local cuisine. 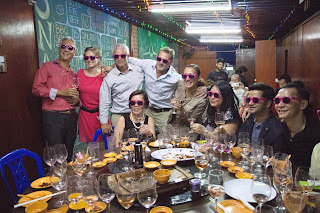 While these two experienced food and wine enthusiasts shared with us their past experiences and opinions on this subject, we the guests had the opportunity to pursue some experiential learning ourselves by trying a variety of local seafood dishes (and steak too, not to forget that one) with a variety of rose wines. (Grenache, Cinsault, Syrah, Rolle and Cab Sauvignon varietals). (Ugni Blanc, Grenache, Syrah, Rolle and Cinsault varietals). (Grenache, Cinsault, Tibouren, Mourvedre, Cab Sauvignon and Syrah varietals). (Grenache, Syrah & Sauvignon Blanc varietals). By and large one can identify 2 noticeable styles among these rose wines. A few showed themselves with a light and gentle body, refreshing acidity, lovely minerality with subtle citrus and red fruit notes. Dry, pale coloured, refreshing rose wines true to nature to delight one’s palate on a hot evening and certainly soothe one’s soul with a lightness of being about them. You can sip a glass, then another for good measure and you get to feel relaxed, happy and wanting some more; a great aperitif, a happy sip I dare say. Then there were the ones exhibiting a study body and structure, good body weight and with a degree of seriousness about them. Rose wines exhibiting a stronger flavour intensity, with a sense of depth and complexity about them. The latter were rose wines which make one pause and take heed of their character and personality. The lighter styled wines were a delight to have on their own, though when paired with food of strong flavour intensity or body weight, these wines played a more passive/background role in the pairing. The 'sturdier' rose wines (though a tad serious to have on their own) complemented and stood well when paired with local dishes. What’s important to note is the fact that neither style of rose wines actually clashed with the food for the evening or made for a bad combination. The lower tannin level exhibited in an average rose wine (as opposed to a still, red wine like Shiraz, Malbec or Cab Sauvignon) makes for the rose’s advantage when chosen as pairing companion for local cuisine. Tannic, red wines can present a challenge when paired with oily, salty or spicy food dishes (and some local dishes can easily go the way of such flavour characteristics). And one sips rose wines chilled; a pleasant and ideal temperature to negotiate local dishes on a hot evening I dare say. Compared to a few years ago, there appears presently a growing awareness and acceptance among wine enthusiasts with regards to rose wines. One reason could be that more wine enthusiasts are taking up wine courses and therefore are willing to be open minded about consuming different types of wine. Another reason could be that holiday makers are including wine regions within their itinerary when travelling abroad these days and come back willing to try new sips. The hot weather in recent weeks, with the assurance of more such days in the near future, puts up a convincing argument for rose wines as well. Whatever the particular reason, prospects for rose wine consumption seem better these days than before.